Materials: cylinder scrap and metal inserts. The various shapes of many-hued plastics cylinders seem to have been made to order for the craftsman who thinks of ashtrays every time the subject of "one-evening projects" comes up. For the convenient sizes of bracelet cylinders available reduce ashtray-making to the simple art of chopping off a section and polishing it. From that point on, completion requires as little or as much work as the maker feels inclined to put into it. The simplest form consists of a section (any length) of bracelet cylinder, fitted with a jappanned black metal insert which is pressed in, and which has little spring-prongs to hold it. These inserts are supplied by some of the plastics companies. Photos of some of these trays are shown in Plates 4J and 3U. Four of the designs shown in Figure 29 are based on this metal insert. Design "A" is a simple section of cylinder cut off and polished in the lathe or by hand. Design "B" employs a simple but graceful curve, while Design "C" goes still further. It consists of a 1-inch wide section of cylinder, rounded and carved with a simple leaf design. Design "D" provides an interesting variation capable of many changes of an original nature. The same cylinder-section and metal insert are used, but the upright consists of a piece of 1/2 inch black sheet with a rounded groove filed in the top. The outlining can be done on a jig-saw, bandsaw. grinding-wheel, sanding-disc or by hand with a coping-saw and a file. Birds, animals or odd futuristic shapes can be given to these cigarette-rests, which may be single, double or triple. Design "G" is a little more expensive, being carved out of a solid 1-inch sheet (four can be cut from a standard-size 6x16 sheet). The recess can be carved best with a router and finished with a hand-grinder employing a ball-shaped mounted wheel, while the grooves are of course filed. Fairly dark colors should be employed in all places where the heat of the cigarette touches the plastic material, as heat tends to stain it a reddish brown. Design "G" is practically self-explanatory, consisting merely of a little fancy turning, or filing with the center bead decorated with a simple-cross-cut. Carving plastics (cast resins) is an interesting adventure, and the best way to start is on simple objects such as ash-trays. (Other ash-tray designs will be found in Plates 4J, 3U and 3G. A trip thru any gift or smoker's supply shop, will reveal many different ideas for ash-trays made entirely from plastics, or incorporating plastics in the design for decorative purposes, and a little experimentation and thought given to the subject will show that this is a most fertile field. Materials: 1/2" scrap and 1/3 of a 1/4" sheet Another interesting type of design, susceptible of considerable variation as fancy or the type of material on hand may dictate is shown in Plate 3G. This uses the conventional glass tray for ashes proper, with the cigarette rests and tray-holders carved out of half-inch black sheet plastics, cemented to a ring of quarter-inch sheet in a contrasting color. A rat-tail file and a fret-saw are all the tools absolutely necessary for this job, although a band-saw, lathe and disc-sander would come in handy. The lathe-work and the fret-sawing could be eliminated by making the bottom ring square, with the cigarette-rests cemented in the four corners. Fig. 29. 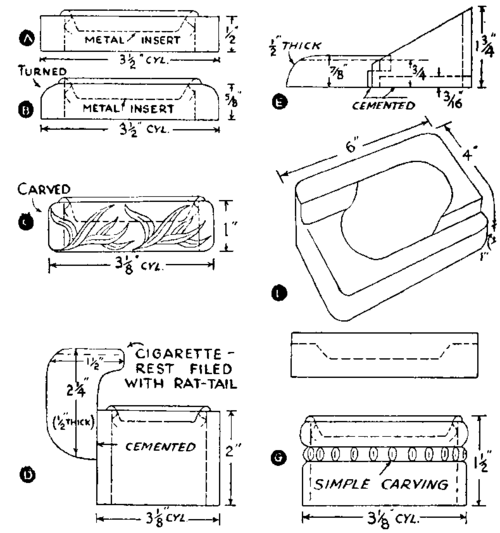 Seven ash-tray designs, described in Project 12. Additional ash-tray designs will be found in the next chapter, most of these requiring the use of power tools.